No surprise here with the Top 5 Quarterbacks in Madden NFL 17. These players are vital to their teams success in helping to take their team all the way. Here are the top-rated quarterbacks in Madden NFL 17. With all the extensive coverage of Madden NFL 12 at the end of last week, along with the availability to play via the ‘Season Ticket’, the announcement of the ‘Club 100′ winners understandably got pushed to the side. Now though lets take a look at the five players who won the right through a vote to receive the coveted 100 rating in a particular category. With 36% of the vote Brady won with relative ease as there was no other player that stood out enough to avoid splitting the remainder of the votes. Peyton Manning came in second followed by Drew Brees, Aaron Rodgers, and Philip Rivers. This one is a bit of a surprise as Peterson often makes the highlights with his power runs – though he certainly is elusive as well. He edged out Jamaal Charles, who was perceived to be the favorite, by just 2%. Ray Rice, Danny Woodhead, and LeSean McCoy all finished well behind those two. With 43% of the vote Harrison had the second largest margin of victory over the runner-up. In this case that was Patrick Willis, who was trailed by Ray Lewis, Clay Matthews, and Ray Maualuga (who got the least percentage of votes of anyone in the campaign with just 2%). Here is where there was no competition. Fitzgerald cruised to 52% with Calvin Johnson the runner up at 24%. Not much remained to be split between Braylon Edwards, Brandon Lloyd, and Dez Bryant. The other close call came in this category where Jackson beat Chris Johnson by just 4%. Devin Hester, Jacoby Ford, and Jamal Charles all collected 10-13% of the votes. 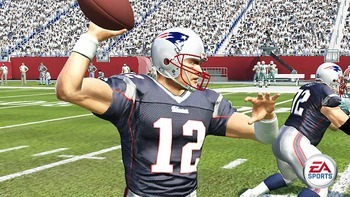 The 100 ratings were not reflected in the most recent Madden NFL 12 roster update. Instead they are expected to be included in the next update which is likely to coincide with the start of the regular season late next week.